The budget 2019 is likely to freeze the much criticized fuel pricing formula temporarily for a few months and also bring down the fuel prices in the domestic market to ease the hardships faced by the low income families, a senior Cabinet minister said yesterday. The minister told Daily Mirror on condition of anonymity for obvious reasons that the freezing of the fuel pricing formula would be initially for three months as the government expects that the global fuel prices would drop considerably in early 2019. “If there was a sharp drop of fuel prices in the global market, the government would pass the benefit to the local consumer for sure. But for the moment there is no sign of fuel price reduction in the near future in the international market. The government has come to the edge of hiking fuel prices and not in a position to increase further on November 10 as usual. The government expects the freezing of pricing formula and bringing down fuel prices would also contribute to reduce prices of essential commodities, services and tariffs of utility services, he stressed. The government would keep a close watch on the price fluctuation of fuel in the international market and reactivate the fuel pricing formula with the easing of prices, he added. He implied that the fuel price reduction in the domestic market would be done through tax cuts on fuel imports and distribution via the budget 2019. The Finance Ministry introduced the fuel pricing formula effective from May 11. 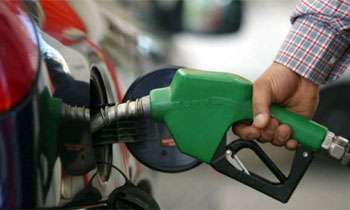 A five member committee of officials was appointed to review the global fuel prices on 10th of each month and decide on prices of fuel in the domestic market. Deputy Secretary to the Ministry of Finance heads the committee. Representatives from the Ministry of Petroleum Resources Development, Public Enterprises and Fiscal Policy Department, President and Prime Minister are other members of the committee. The committee most probably will not meet on November 10 to decide fuel prices in November - December period, the Minister noted. Any interference with the free market economy by the government is a mistake and will have unforeseeable consequences. There is no free market. All product prices are manipulated through taxation.